Originally, the company only took bets via the telephone, but is now mostly focused on its online operations. In addition to sports betting, Sportsbook.ag customers can enjoy a Las Vegas style online casino, an online poker room, and even Daily Fantasy Sports (DFS). Sportsbook.ag does not currently offer a sign-up bonus for its sports betting operation, instead it focuses on value-packed promotions all year round. That said, they recently added a 20 percent bonus offer on any deposits made via Bitcoin. You can contact customer services before making your first deposit to see what other perks they can offer. Sportsbook.ag accepts customers from around the world, including the United States. However, new customers from states such as Kentucky, Louisiana, Missouri, New York, Utah, and Washington State are not being accepted. Sportsbook.ag will keep you on your toes constantly with their various contests and promotions whether for their sportsbook, casino, poker room, or horse races. Some of the current Sportsbook.ag promotions include square basketball contests, betting $25 or more on your favorite basketball teams and receiving a free $5 bet for doing so, while NBA, NFL, and NHL playoffs brackets can award up to $15,000 in prize pools. They also offer a 100 percent matching refer a friend bonus worth up to $50 for every friend you convince to sign with with Sportsbook.ag. Which promotion do you want a piece of? Sportsbook.ag offers you a host of ways to deposit money into your account, around the clock, worry free. No matter how you prefer to handle your money, Sportsbook.ag has you covered by offering deposits through wire transfers, checks, gift and credit cards, along with Neteller and even Bitcoin. American customers are not permitted to deposit via eWallets, however. In order to withdraw your funds, you will need to submit some identification to the Sportsbook.ag customer support team, although this is not out of line with other online betting sites. Other than its 20 percent sign up bonus with Bitcoin, Sportsbook.ag does not currently offer a sign-up bonus for its sports betting operation. Instead it focuses on offering value-packed promotions all year round. That said, you can contact customer services before making your first deposit and they will often offer you a bonus of some kind. It does, however, offer a $100 match bet in its casino where your first wager in the casino is returned up to $100, while online poker players can enjoy a 100 percent up to $1,000 first deposit bonus. Sleek and clean are two words that spring to mind when describing the Sportsbook.ag website. The fonts are fresh, the color scheme is pleasing on the eyes, and the interface is simple yet effective to use. With all the betting markets listed down the left side of the screen, you can click between more than a dozen different sports in mere seconds, and the associated odds are displayed almost instantly. Sportsbook.ag has an extensive list of betting markets and lines across dozens of sports. Although it is North American sports such as NHL, NBA, baseball, and NFL that are the most popular betting markets, you will also find golf, soccer, boxing, MMA, motorsports, cycling, horse racing, and even bets on politics at Sportsbook.ag. It is safe to assume that whatever you want to bet on at Sportsbook.ag you will find a betting market for it. There are four ways to withdraw funds from your Sportsbook.ag account - check, bank wires, cash transfer and Bitcoin. The maximum payout va check is $2,500. The processing fee for checks is three percent, regardless of the amount. Bettors receive one free check per calendar year. Bank wires process at around the same time frame and have a similar three percent fee attached to the requested amount. Bank wires have a maximum withdrawal amount of $5,000. Western Union and MoneyGram process Sportsbook.ag cash transfers. It can take up to a week to process, which is slow, and incur fees between 15-20 percent of the amount withdrawn. Even Bitcoin withdrawals, processing in between 4-7 days, are slower than other online sportsbooks. Most Bitcoin transactions are free of fees, although on rare occassions there can be a stipend of between 3-5 percent of the amount withdrawn required to free your funds. Sportsbook.ag offers some of the softest odds available to U.S. bettors in the online sports gaming industry. Their underdog odds are generally outstanding. They also aren't nearly as quick to limit the betting range of a persistent winner on their site the way some sportsbooks seek to find the pros hiding within the recreational bettors. You'll find the usual menu of betting types at Sportsbook.ag - straight bets via point spread, moneyline, and totals on all the major sports. They also offer teasers, parlays, if-bets, round robins, and reverses. You can make a future wager on just about every sport imaginable, and dozens of player and team props. A unique feature at Sportsbook.ag is that they will allow you to play parlays on prop wagers, even across different sports. Sportsbook.ag received the prestigious Best U.S. Sportsbook in 2005 and 2006 and it is easy to see why. Despite focusing its attention on North American sports – almost every sport has a betting market – it has a large number of foreign betting markets to place wagers on. Its plentiful promotions and superb betting odds, particularly on the underdogs, make Sportsbook.ag the first port of call for thousands of sports bettors each and every day. An appealing feature of the Sportsbook.ag site is that you can fulfil all of your gambling needs under one roof with a state of the art online casino, online poker room, and even Daily Fantasy Sports being offered to everyone. One of the reasons for the site’s longevity is its focus on offering some of the best betting lines and betting odds to bettors located in the United States. As Sportsbook.ag is focused on recreational sports bettors, you will often find the underdogs in games have some fantastic odds, in fact some of the best in the industry. The ability to not only bet on sports, but to play online poker, and gamble in a state-of-the-art online casino helps make Sportsbook.ag stand out from the crowd and keep its punters happy. At the websites for most online sportsbooks, you will easily find customer service, whether it be live chat, email or via a toll free phone number. That isn't the case at Sportsbook.ag. They are harder to get a hold of than trying to catch fish by hand. Click on the contact us button on the Sportsbook.ag web page and you'll be taken to the My Account section of their site. There's no quick method to get in touch with anyone from Sportsbook.ag if you run into an issue. To save you some work, you can call them toll free at 1-800-632-6088 and agents are available between 8 a.m. and 3 a.m. EST, or you can email them at support@sportsbook.ag. 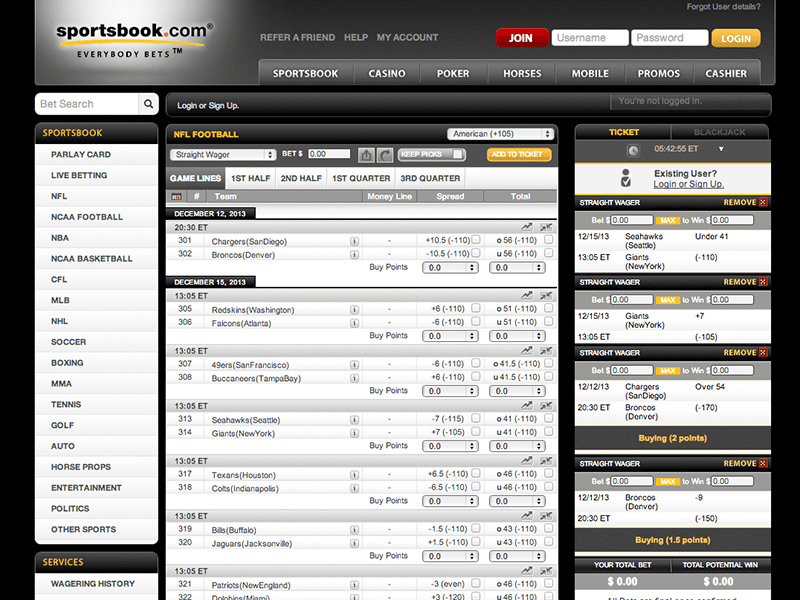 You'll find the live betting interface in the left-side drop down menu of the Sportsbook.ag we page. You can either click to go directly to the live betting homepage, or you can head straight the page for the page on which you intend to make you live wagers. A stellar feature in their live betting platform is at the top of each game, you will get an instant recap of where the money is being wagered on that game, allowing you to instantly analyze trends and metrics. As well as providing mobile access to their sportsbook, Sportsbook.ag also features a mobile racebook, casino and poker room. 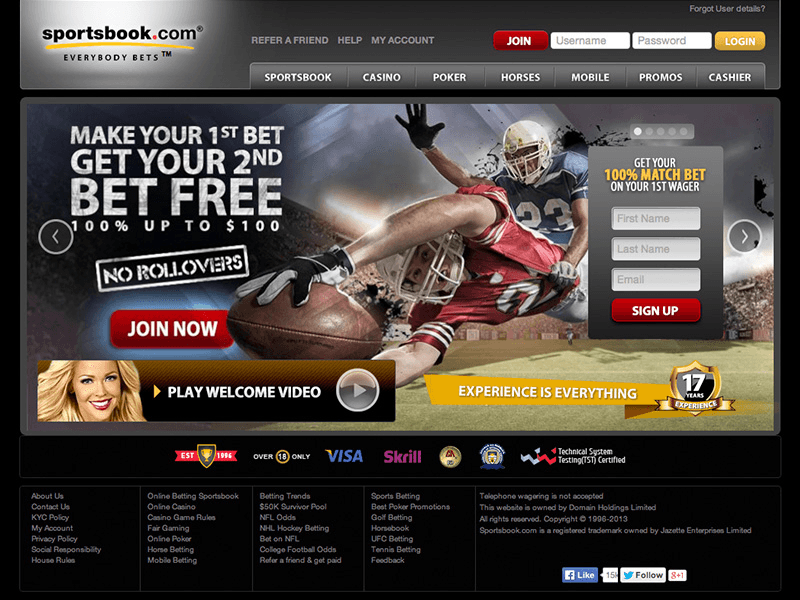 Sportsbook.ag was among the first in the online gaming industry to go mobile. Theirs is a no download option. There is no app involved. You simply access the Sportsbook.ag mobile site via the web browser on your mobile device. It is compatible with iPhone, Windows Phone, and Android devices. Head to the Sportsbook.ag online casino and you will find more than a dozen table games, including blackjack, roulette, baccarat, and Craps, to play, along with the staple favorites such as slots, jackpot slots, and video poker. Sportsbook.ag casino runs regular blackjack tournaments that have prize pool of $1,000 or more, making it a potentially profitable place to try your luck. If online poker is your game of choice, you should be delighted to learn there is a Sportsbook.ag poker room. The poker software needs no download, meaning you can play it in your computer’s web browser. New customers can enjoy a 100 percent up to $1,000 first deposit bonus, while existing customers can claim a monthly reload bonus. Other poker promotions include a bad beat jackpot, daily freeroll tournaments, and $6 million in guaranteed tournaments every month. You will find racing galore in the Sportsbook.ag racebook with cards from numerous thoroughbred and standardbred tracks from around North America and the world on tap every day. You can partake in their season-long Breeders' Cup Challenge competition, and while you are wagering on the ponies, you will be eligible for the Sportsbook.ag daily eight percent cash back reward on all winning and losing bets placed in the racebook. Close Visit and see for yourself... Bet now!